WHAT: Trying to get a more precise timeline of the Paleocene-Eocene thermal maximum mass extinction (PETM). WHERE: Proceedings of the National Academy of Sciences of the United States of America (PNAS), vol. 110, no. 40, October 2013. The Paleocene-Eocene thermal maximum (or PETM for short) occurred around 55.8million years ago and is considered the best historical comparison to what we’re currently doing to the atmosphere with carbon pollution. There was rapid global warming of around 6oC which was enough to cause a mass extinction, but from Deep Ocean fossilised carbon isotopes the estimate for the time the extinction took is between less than 750 years and 30,000 years. Obviously this is a huge window of time, and unless it can be further narrowed down, not very useful for humans trying to work out how long we have left to do something about climate change. Narrowing the time scale for the mass extinction is what these researchers tried to do. Firstly, there are several ways the PETM mass extinction could have happened. The possibilities are; release of methane from reservoirs like permafrost or under the ocean, wildfires in peatlands, desiccation of the ocean (which is the air warming up enough that the ocean starts evaporating), or meteor impact. Without working out the timing of the extinction, we can’t work out which method caused the extinction. So these researchers went to an area of the USA called the Salisbury Embayment, which is modern-day Delaware but was shallow ocean 55million years ago. Because it was shallow ocean that fossilised, it has a more detailed record of ancient ocean sediment because it’s now dry land, whereas ocean sediment currently still under the ocean keeps getting changed by ocean currents so only show bigger changes. 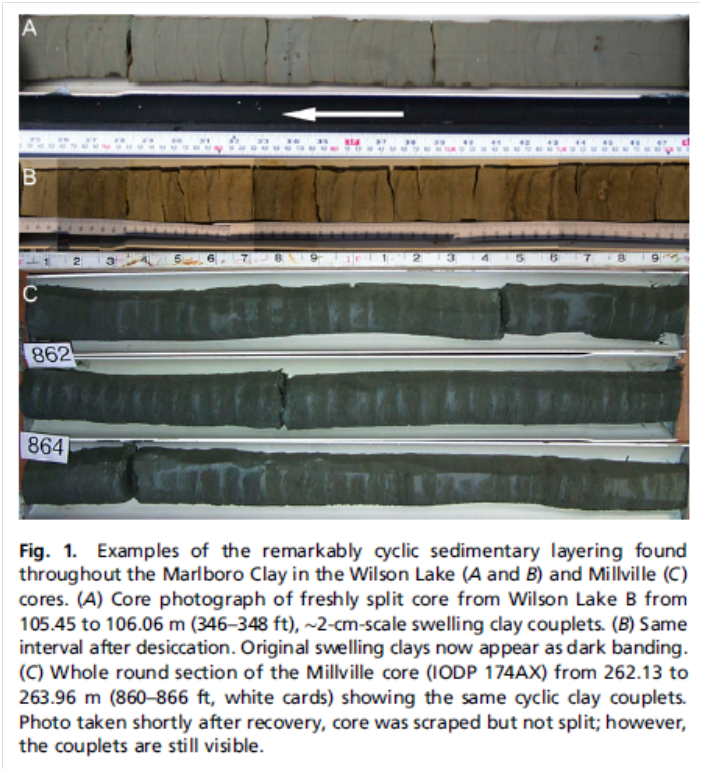 The researchers looked at sediment cores from Wilson Lake B and Millville which have distinct and rhythmic layers of silty clay through the entire section that corresponds to the carbon excursion into the atmosphere. The distinct layers you can see above occur every 1-3cm along the core which allows for a more precise chronology of the mass extinction. First they ran tests for the amount of 18O (an oxygen isotope) and found cycles of a 1.1% change consistently through the core from Wilson Lake B. They also found a similar cycle in the Millville core. They then tried to work out what kind of time scale this could line up with. After running a few different ideas that didn’t fit with other evidence from the period, they worked out that the oxygen cycles were consistent with seasonal changes and means the sediment cores line up to being 2cm of mud per year. This is excitingly precise! It also fits for what researchers know about the build up of sediment in shallow areas – eg. The Amazon River can accumulate 10cm/year of mud and clay, so 2cm per year fits the other evidence. Next in the researcher’s Whodunit, they sampled the beginning of the carbon release which was at 273m along the core. To be precise they sampled from 273.37 – 273.96m and tested for 13C (a carbon isotope). They found the concentration of carbon dropped in the silt to 3.9%, then 1.45% and then to -2.48% over thirteen years. A drop in the ocean concentration of carbon means it’s being released into the atmosphere. The concentration of calcium carbonate (CaCO3) which is what shells are made of also dropped from 6% to 1% within a single layer of sediment. So there was definitely something going on, but what exactly was it? The beginning of the carbon release is the unknown bit, and it’s generally agreed that the recovery from the 6oC of global warming took 150,000 years. The sediment layers show that the release of carbon was almost instantaneous (happened over 13 years) and after the release it took between 200-2,000 years for the ocean and the atmosphere to reach a new equilibrium. This means that after the initial carbon release the atmosphere changed rapidly for the next 2,000 years before it reached the ‘new normal’. From there it then took 150,000 years to go back to the original normal from before the carbon release. Long road to recovery – PETM followed by a slow slope back to normal temps (from Hansen et. al PNAS 2013) bottom scale in millions of years. Looking back at what order of events could have caused this for a mass extinction, the only one that fits is methane release AND a meteorite. There was a recovery of carbon isotope concentrations in the upper clay which the researchers state indicates it was carbon from the atmosphere going into the ocean, with a greater level of carbon movement in the shallow areas than the deep ones. However, the meteorite alone (which is the carbon from the atmosphere into the ocean) wouldn’t be enough to cause 6oC of global warming. It requires around 3,000 Gigatonnes (Gt) of carbon to change the atmosphere by that degree, hence why the researchers think it was a meteorite and methane release from the ocean that add up to the 3,000Gt. So what are the lessons for humanity in this great carbon excursion of mass extinction? Firstly, climate change can happen quite quickly. Secondly, once you’ve changed the atmosphere, it’s a long road back to the normal you had before you burned the carbon. Thirdly, it only takes 3,000Gt of carbon to cause a mass extinction. The last UN IPCC report gave the planet a carbon budget of 1,000Gt of total emissions to keep humanity in a level of ‘safe’ climate change. Currently, the world has burned half of that budget and will blow through the rest of it within the next 30 years. If we burn enough carbon to start releasing methane from permafrost or the oceans, it’s a 150,000 year trek back from a possible mass extinction. I guess it is true – those who don’t learn from history are doomed to repeat it. How about we learn from history and stop burning carbon? Oct. 29th – caption for Cenozoic era graph changed for clarity (time scale is different as the graph is from a different paper). This entry was posted in atmosphere, climate change, greenhouse gases, mass extinction, oceans and tagged paleoclimate, PETM by amyhuva. Bookmark the permalink. Great post, Amy. You’ve really explained this so well. The only thing I’m confused by is how a meteorite can add additional carbon to the atmosphere? This is definitely not my area of expertise, but it’s the trigger for atmospheric chain reactions. “The researchers calculated that the impact would have generated thousands of earthquakes of up to magnitude 9.9, significantly more powerful than the largest recorded by modern seismologists for hundreds of kilometres around, releasing huge amounts of oil and gas from the shattered rock. So the meteorite made the methane release larger than would have otherwise occurred and made it faster too. OMG, thousands of earthquakes of up to Mag 9.9! The stuff of my nightmares. What is the full reference for the source of the diagram showing ocean temperatures and oxygen isotope values? I searched the PNAS contents and can’t find it. Also, the units on the time axis aren’t shown, but it looks like it should be millions of years since it shows the full Cenozoic. So how could “2000 years of change” be visible at that scale? Thanks, in advance, for your help on these points. The 2,000 years of change is not really visible on the scale as it is millions of years – I used the graph more to show how long the return to ‘normal’ temps took after the PETM since the paper I was writing about didn’t have any graphics to demonstrate how long the recovery took (because it was focused on the beginning of the carbon release). I’ve edited the caption so it’s not confusing – thanks for the feedback.